I told our friends that May was the best month to visit Oregon. Not early summer when the tourists show up in droves. Not late summer when the wildfires in the western forests fill the days with murky smoke. They listened and began their trek north to Washington State at just the right moment. Lucky us, their route brought them close to us. We had four Magical May Days with them. I am enamored with the progression of Spring this year. I have watched the progression for a bit more than a month now, with changes every single day. Every trip to the grocery store or to town or to the Grange to buy annuals or Bi-Mart to buy mulch is rewarded with another evolution. I don’t think I have actually noticed before that the flowering trees come and go in a beautiful sequence, slow motion waves of color beginning with that first blush of pinky pink on the flowering plums. The leaves aren’t out yet at that stage, but the pinks are everywhere, and some whites as well, with the early flowering pears sprinkling snowdrifts of white blooms against the skies. In just days, the plums begin to fade and the cherries begin their ballerina pink show, fluffy big flowers that up close look exactly like tutus. 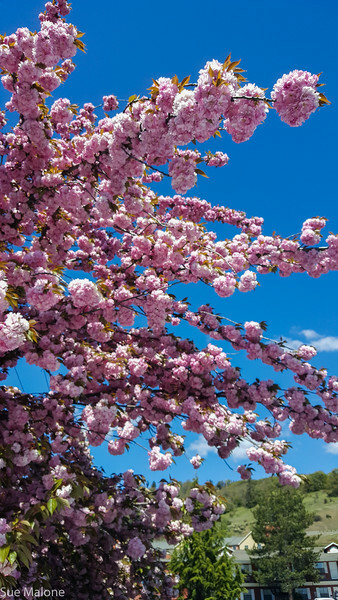 I noticed this year that Grants Pass must be a perfect climate for the cherries, especially the magnificent Kwanzan cherries, with some trees covering half a parking lot with their pinkness and solid trunks the size of oak trees. About this time all the yellows begin, with daffodils everywhere, especially along the roadsides where they seem to have naturalized on their own. I can’t imagine anyone could actually plant that many daffodils. In our own yard, where I planted a few dozen when we first got the property, they seem like a small dab of yellow compared to those huge drifts I see along the roadway. I kept wanting to figure out a way to park and take photos of some of those drifts, but with narrow roads and fast traffic I never quite figured it out. 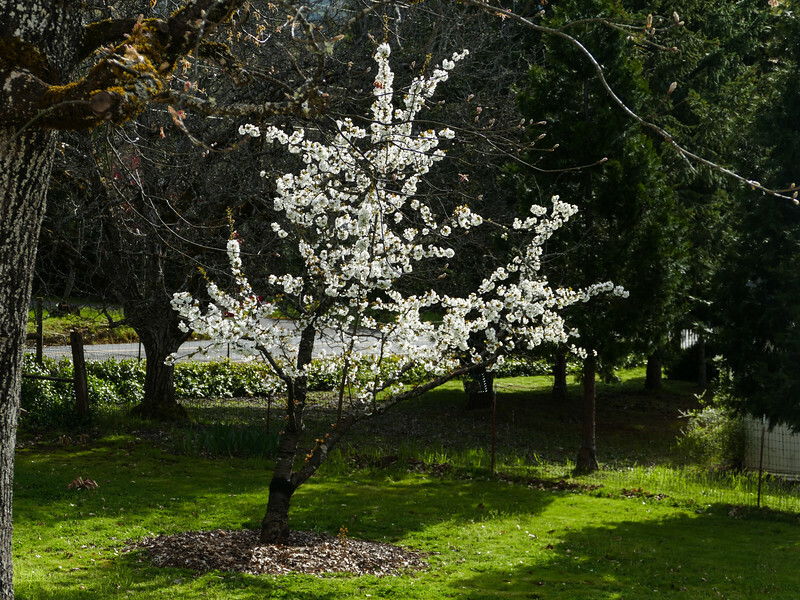 The cherries must have lasted three weeks, with a world dominated by pink and yellow but still very few leaves. As the cherry flowers began to mature, the rhodies burst into their brilliant reds, pinks and purples, and right about that same time was the magical “leaf day”, the moment when suddenly a backlit tree in the late afternoon sun is glowing with fluorescent green. It is an amazing moment, with willows showing first and then the birches and aspens, the maples, and finally in a crazy wild burst of incredible magic, the oak leaves unfurl from their pale reddish curls into full green magnificence. Suddenly the world is somehow completely different. The oak leaves leave shadow traces against the house and make sunlight flicker through the living room windows. This time of year, the green is still new, still lime colored and shades of chartreuse, unsullied by dust and hot summer winds. The cherry blossoms are giving way to leaves as they begin to fall, but just as that pink fades, the brighter coral pinks of the dogwoods have burst into bloom and other white dogwoods light the skies with their clouds of happy flowers. The daffodils have faded but in their place the irises are opening. We are a mere 300 feet in elevation above the main part of town, but the irises bloomed there a full week before mine opened up. 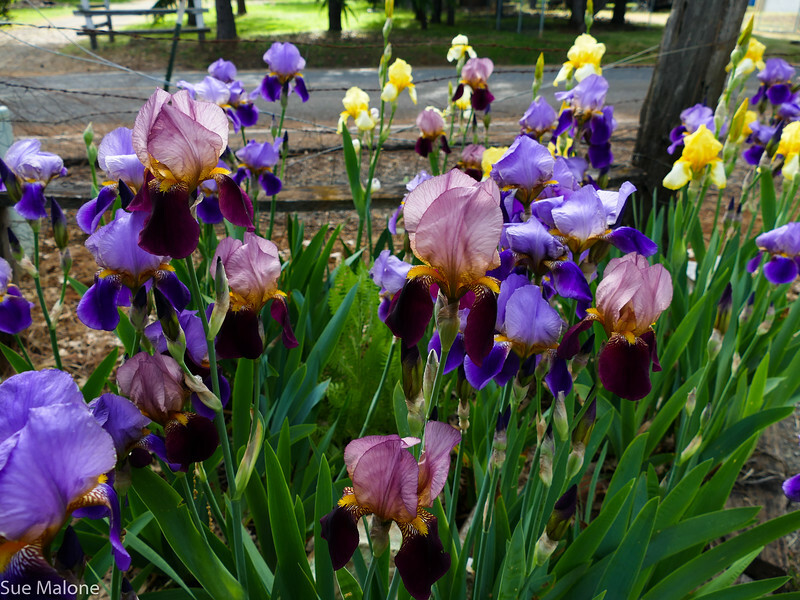 Now we are in full on iris season as the brilliant flowers of the rhodies begin to fade and fall. Other shrubs are beginning to bloom and the colors shift from pastel pinks and yellows to brighter shades of late spring and the lime green leaves turn a darker green with every passing day. The roses and peonies are now covered with fat buds, waiting for their turn. I have a lovely pink oriental poppy that is opening in the afternoon sun today, one flower at a time, joining in the noisy wild joy of spring. Erin and Mui arrived Monday, after a long 300 mile day driving north from Reno, landing at Valley of the Rogue State Park late in the afternoon after a bit of a scary moment on the highway. I’ll let Erin tell you about that one in her own blog. (Erin writes one of my favorite travel blogs of all time, with amazing photography and wondrous detail. Don’t miss it!). I put together an early summer supper of Copper River Salmon on the grill with pineapple-mango salsa, an “interesting” side dish of quinoa, lentils, and pine nuts that they were kind enough to enjoy, but Mo said maybe don’t make that one again. Ha! Plated Greek salads with reduced balsamic drizzled over the feta dressing were a hit, though, and kept us all entertained while the fish cooked. Crème Brule for dessert, a choice of vanilla or latte flavors were fun. The only glitch in the day was the failure of the culinary torch to fill with butane. I panicked, drove wildly to the kitchen store, bought another torch and another canister of butane, only to get home and have it not work, again. More panic, the brule’s were sitting on the counter with the raw sugar waiting for the fire! A quick internet search and a You Tube video informed me that I was holding the canister right side up instead of upside down. What in the world did we do without online videos?! Even though we have not actually visited with Erin and Mui in person since our trip through Texas in 2014, it was as though no time had passed at all. Erin and Mui are so incredibly delightful and easy to be around. 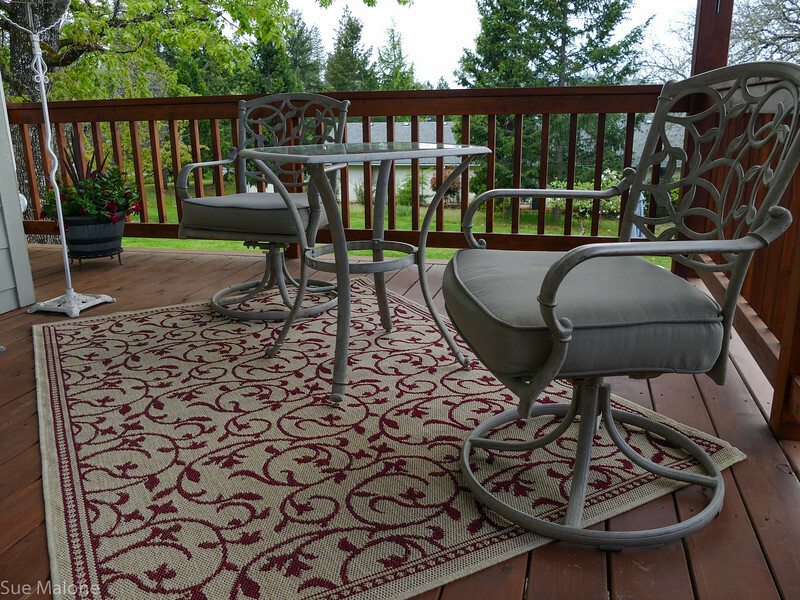 We sat on the porch of Sunset House long into the evening, and confirmed sight seeing plans for the upcoming week before they returned to the Phaeton at Valley of the Rogue. Sad to say, even though we have a sewer hookup and 30 amp, our drive cannot accommodate a 40 foot rig. Mo missed out on our first day sight seeing due to a required follow-up visit with her doctor. She was just a week out from an emergency appendectomy and needed to be sure everything was OK. We have been to Crater Lake often, so it was an OK day to miss, although we all really missed having her with us. 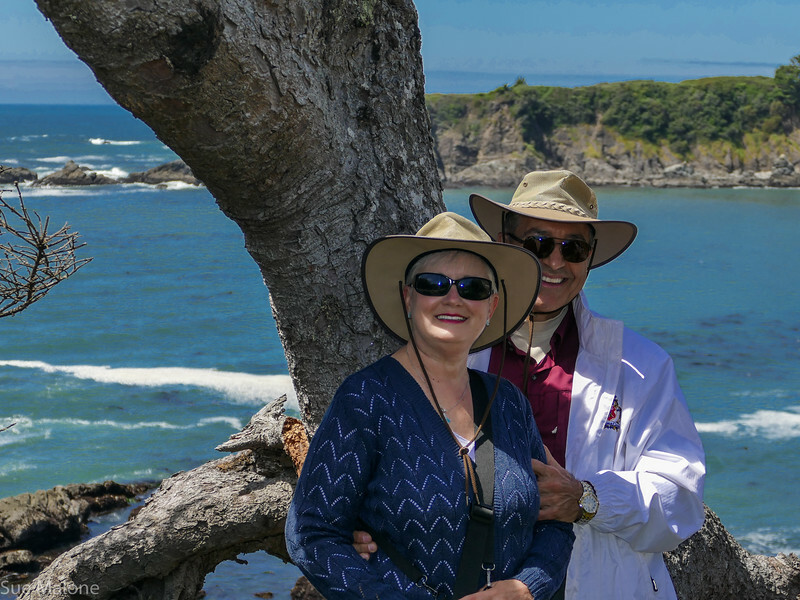 I picked Erin and Mui up at the park and we headed up the highway, over the hills, crossing the Rogue River several times before we arrived at the mandatory Natural Bridge Viewpoint where the Rogue roars in and out of lava caves and tunnels through a gorgeous wild canyon. Erin and I share a love of photography, and I enjoyed following her around and watching how she framed shots so carefully. Continuing up the mountain toward the lake, we saw the green leaves of springtime give way to the more somber greenish black of conifers at an elevation where spring is still to come. 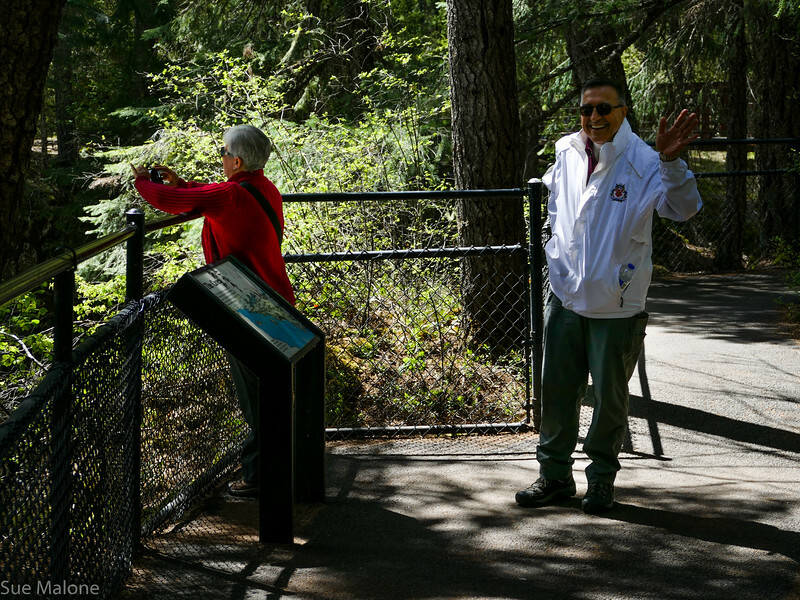 Mui wasn’t yet 62 when the price of the Senior Lifetime Pass went from $10 to $80, but with that birthday behind him, he was happy to go into the visitor center and purchase his new pass. Even at $80, that pass is a fabulous deal for visiting national parks for free for the rest of your life, among other benefits, including half price camping at federal facilities. I was excited to see my home country through new eyes. Somehow showing people our beautiful part of Oregon who are seeing for the first time, reminds me to really look at my surroundings in a different way. Approaching the Rim View area is always thrilling, but this time not quite so much because the snow banks were so high that we couldn’t yet see the lake. 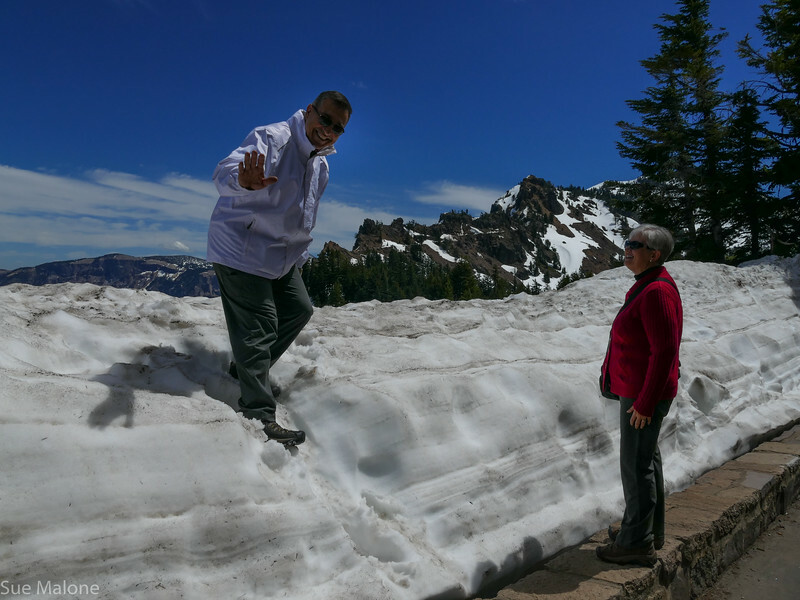 We drove toward the beautiful historic lodge, which was closed until May 18, and finally found a snowbank we could climb to at last get that first view of Crater Lake. So gorgeous, and the blue really IS that blue. Somehow the surrounding snow on the cliffs and mountains added to the drama, and the ribbons of cloud in the sky make the lake reflections even more interesting. I had planned a picnic, thinking we might find a table, but all the tables were deeply buried under the snowbanks, so we opened the tailgate and had a picnic right there in the parking lot. As we were finishing up our lunch, I mentioned that during the winter the Park Service has free snow shoe trips around the trails and even provides the snow shoes. Within minutes after I spoke, a big long line of kids appeared over the ridge, clomping on the snow shoes as they reached the parking lot. I had no idea they did the tours this late in the year, but we decided it must have been a special school tour of some sort. 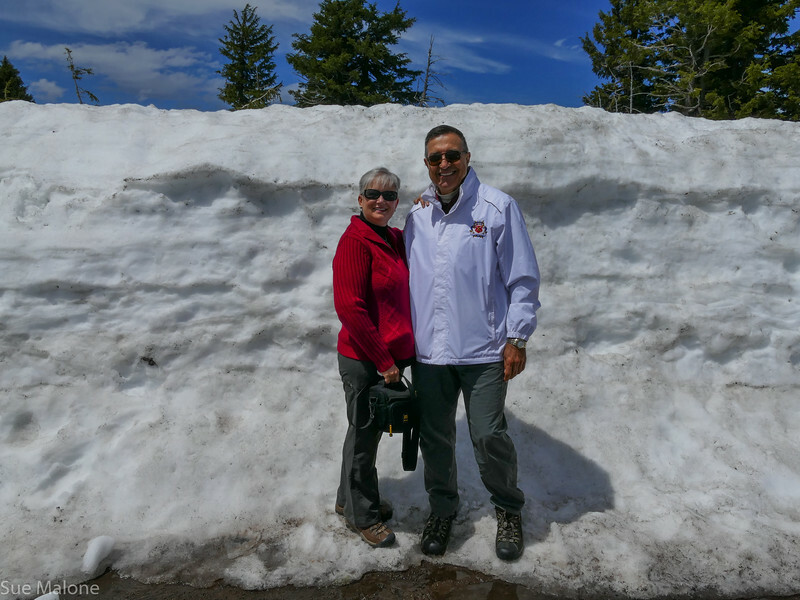 The road around the lake was still closed with deep snows, and we were only able to drive up the west side road for an additional mile to Discovery Point for a few more amazing photos. 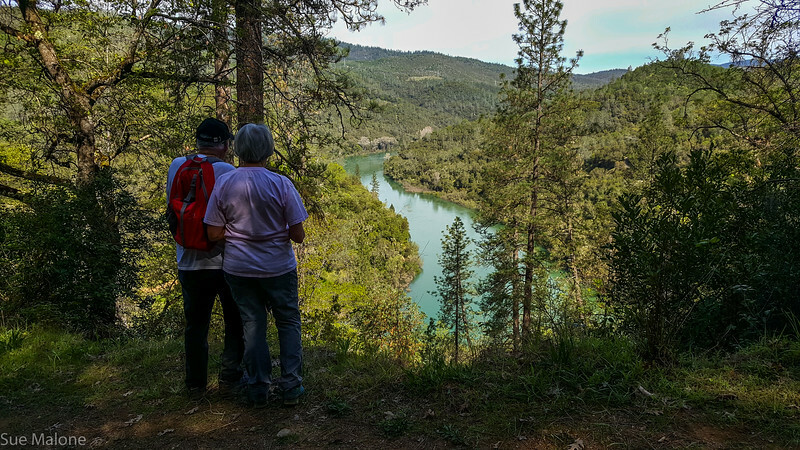 With a twinge of sadness, we left the lake behind and traveled east and down the hill into the beautiful Wood River Valley, not far from our old Rocky Point home. We took a side trip to the Headwaters of the Wood River, but by the time we got there the skies were gray and threatening, and the mosquitos were out, so we were quite happy that we had already had our picnic. Still, I think Erin got some photos of the gorgeous blues of the spring where the Wood River emerges almost fully formed. I didn’t even take out my camera this time! Continuing back toward Rocky Point I showed them our previous home in the woods. It looks very different now, since the new owners have yet to live there full time and the gardens and lawns are unkept. I felt no sadness as we drove past the house, our new life and our new home is wonderful and while we have great memories, I am so happy to live in the sunlight and openness of Sunset House. 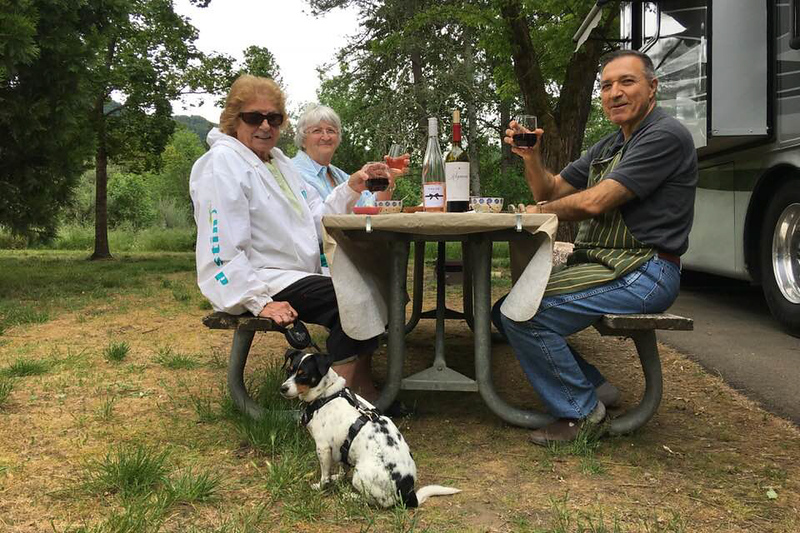 For our next day, we had originally planned to do a shorter trip through the Applegate Valley, viewing some of the wineries, maybe picnicking somewhere along the way, visiting Jacksonville and then home. A nice short day for people who have been on the road a LOT lately. That all changed as we checked out the weather and Mo and I started talking about maybe going to the coast instead. I wrote a note to Erin suggesting a change of plans and they were right on board. 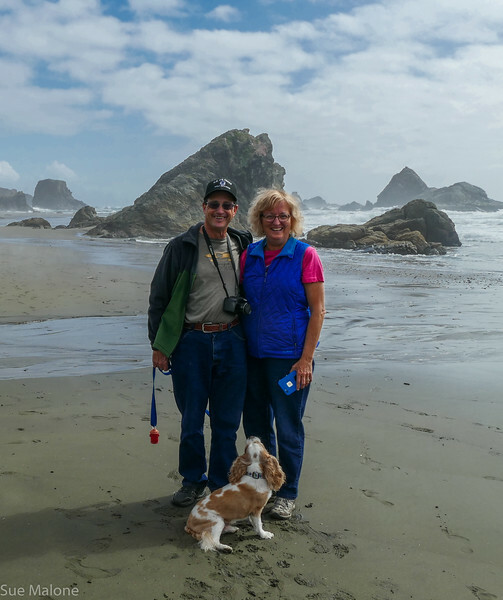 Neither of them have seen the Oregon Coast, or the Redwoods, and with Brookings just a short 2 hours away, they were up for another long day of sight seeing with a great destination. 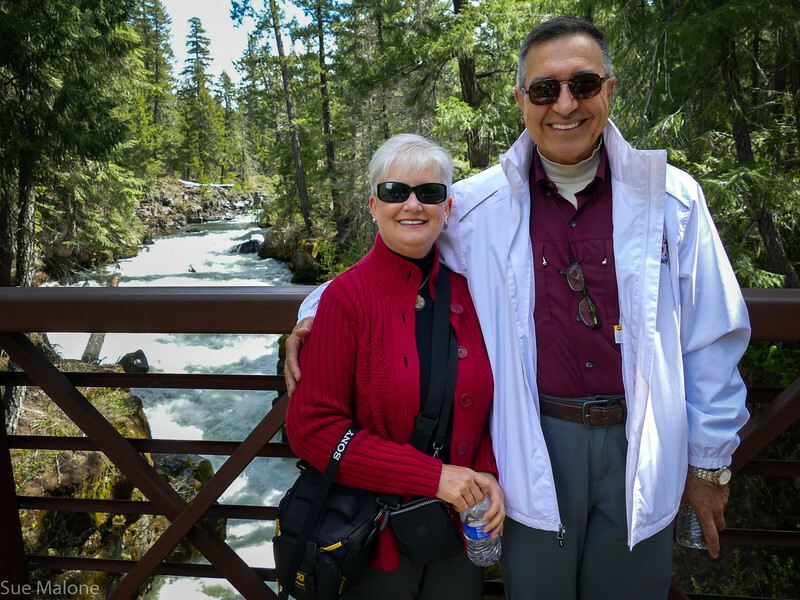 Once again, I loved driving 199 with guests so I could appreciate the drama of the Smith River below the winding road, and savor the ferns and waterfalls along the way. Mattie even got to go with us on this day, with Erin and Mui being great sports about sharing the back seat with her. Mattie loves company, and made another set of good friends who enjoyed her almost as much as she enjoyed them. 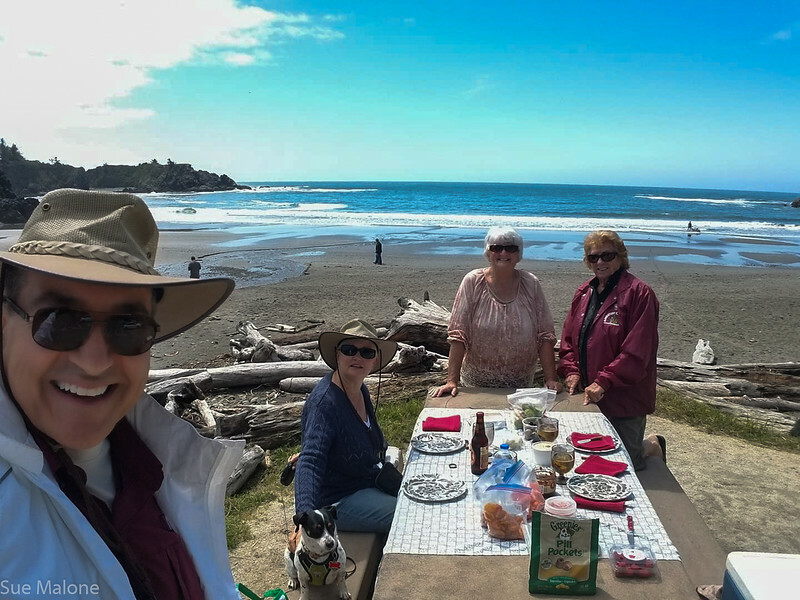 We got to the coast in early afternoon, just in time to find a perfect picnic table at Macklyn Cove Beach where we once again brought out the goodies for lunch. 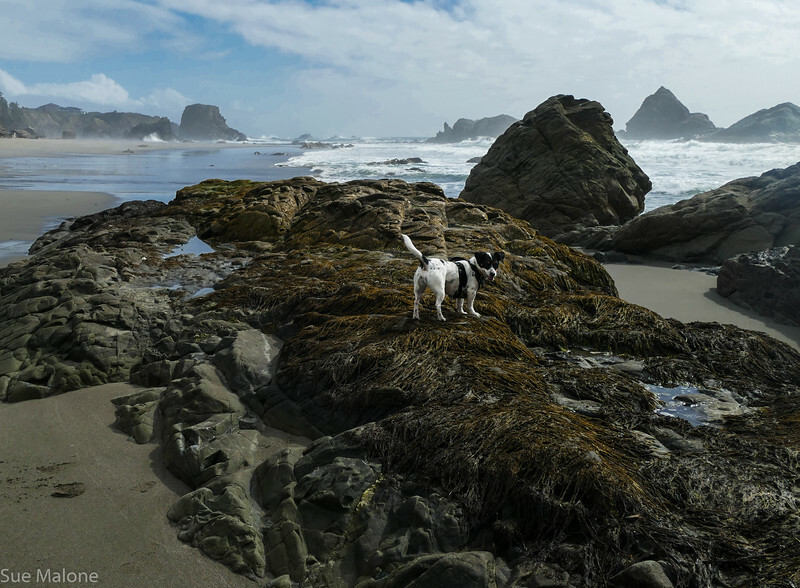 Mo and I love this little beach because Mattie can run free here in the off leash area, unlike Harris Beach State Park where leashes are required. 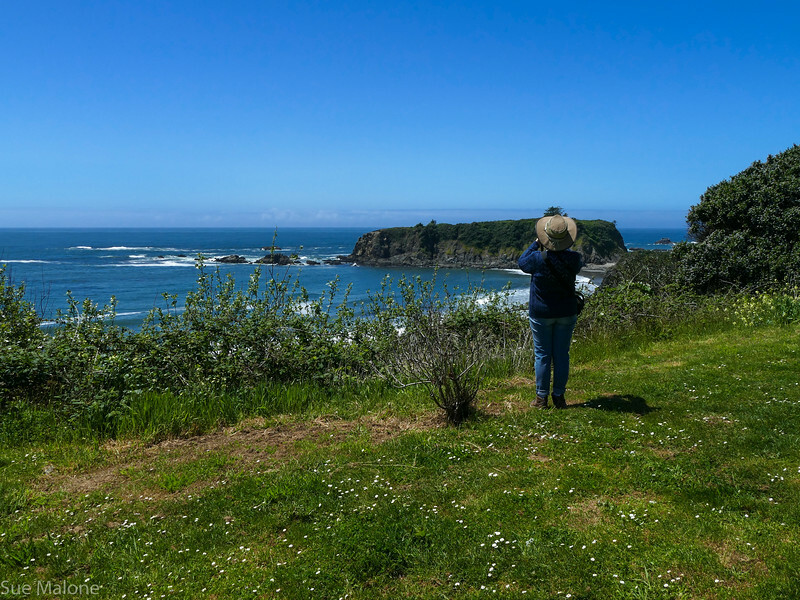 After lunch we decided to hike the Chetco Point Trail, a perfect little jaunt to a beautiful spot overlooking the ocean, the town, and the beach below. 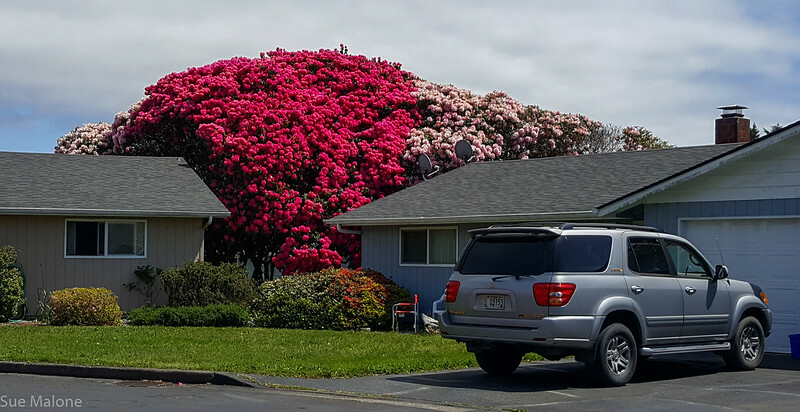 A short drive north after our hike led us to Harris Beach, but along the way we found a small 55 plus community that had the biggest rhododendrons I have ever seen in my life. It was like something out of a dream, with these huge pink trees completely covered in blossoms dwarfing the small modest homes beneath them. Amazing. Another walk down the South Beach Trail took us to the water once again. Mattie had a great time running and playing ( beyond the state park boundary) and Mui did his favorite thing of walking right along the water. It was a bit early for sea stars but the weather was incredible, with warm temperatures, full sunshine, and no wind. What an amazing lucky treat for a quickie day on the Oregon Coast. 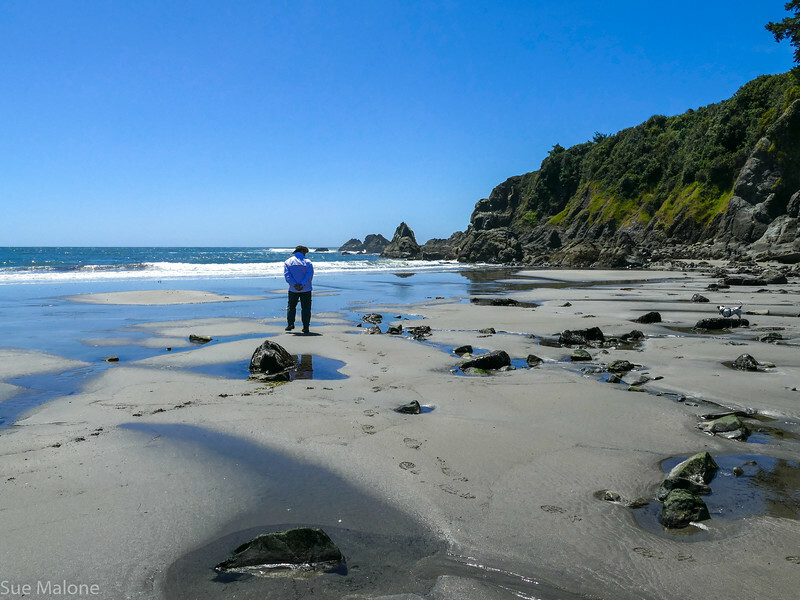 The trip home along Highway 199 gave us a chance to stop in for a drive through Jedediah Smith State Park to let Erin and Mui experience the huge redwoods for the first time. 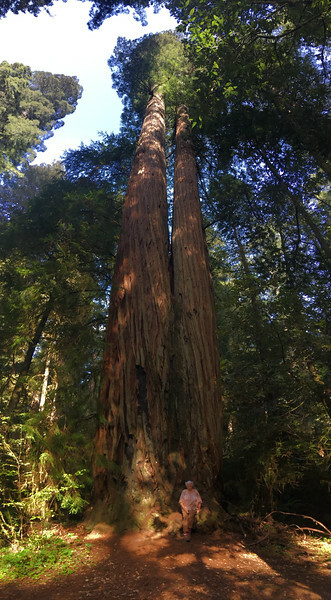 We had great fun trying to get the phones and cameras to do the proper vertical panoramas to capture the incredible height of these ancient trees. By the time we arrived back in Grants Pass it was almost 7, and everyone was tired and ready to retire to their own space. Mo and I talked about how we live here most of all because it is so accessible to everything we love. We can do the beach in a day, do the high Cascades in a day, can kayak our favorite creeks in a day, and can even get to the high desert in just a day if we choose. Erin and Mui are thinking about the long term future, where they might want to settle down someday. Mui asked me specifically what I DIDN”T like about living in Oregon. I spent three days trying to come up with something and all I could think of was that what I like least are the late summer fires and smoke season. Maybe a bit more fog in the winter than I might like, or a bit more heat in the summer, but nothing at all that would convince me to live anywhere else. Ever. The next day was to be a quiet one, with Mui preparing for our luncheon feast. Mui brought Erin to the store where I picked her up so she and I could play around in Grants Pass with our cameras and I could show her a bit more of our charming small town. 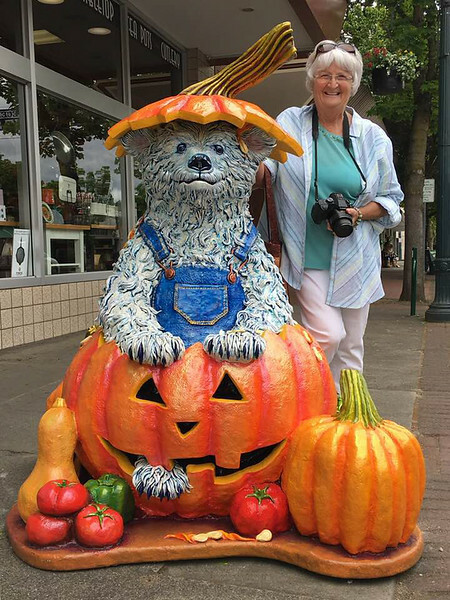 We wandered about taking photos of the murals and the town bears that are brought out every summer to grace the street corners. 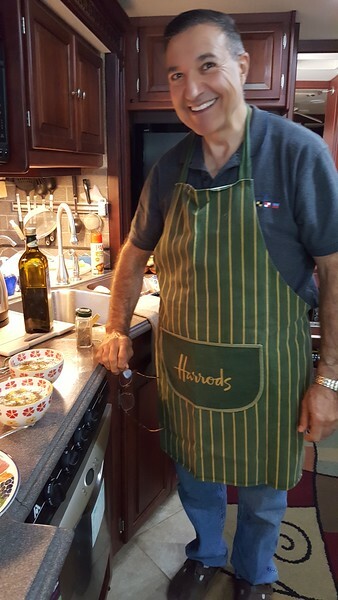 Back home, we picked up Mo and Mattie at the house and drove again to the State Park where Mui greeted us in his fabulous Harrod’s apron. I learned that Harrod’s is NOT Harrah’s. The first being a very classy high end place in London and the second a big casino in Reno and Vegas. Ha! Mui definitely earned his apron stripes with the lunch he has prepared for us, including homemade hummus with olive oil and paprika, Turkish ‘cacik’ cold yogurt soup, grilled beef and lamb kofte (Turkish meat patties) that were moist and tender, a delicious ancient grain dish that was exponentially better than my attempt, and home made brownies and ice cream for dessert. I love Mui’s cooking, and he loves doing it as well. We visited the rest of the afternoon. laughing and sharing stories, talking about future plans and upcoming adventures. We talked about ‘friends’ and ‘acquaintances’, and agreed that we are truly friends. It was a bit sad when we left, wondering when we might cross paths again. I am sure we will, and in the mean time, we will share blogs, and photos, and emails, and facebook posts, and private messages about whatever. It’s what friends do. And when we get together again it will be as though no time has passed. Just a reminder, if you click on any of these photos, you will be taken to the SmugMug album where you can view many more scenes from Sunset House and all the gorgeous kayak views. As often happens, I can only seem to begin writing by paying attention to what is happening right now. Get in the moment, so to speak. I started this blog a week ago, going back over my calendar, reviewing my photos, thinking and remembering what early April felt like. It seems like a VERY long time in the past. The cliché is that time flies the older we get, but I am grateful that the month of April seemed very nice and long to me. 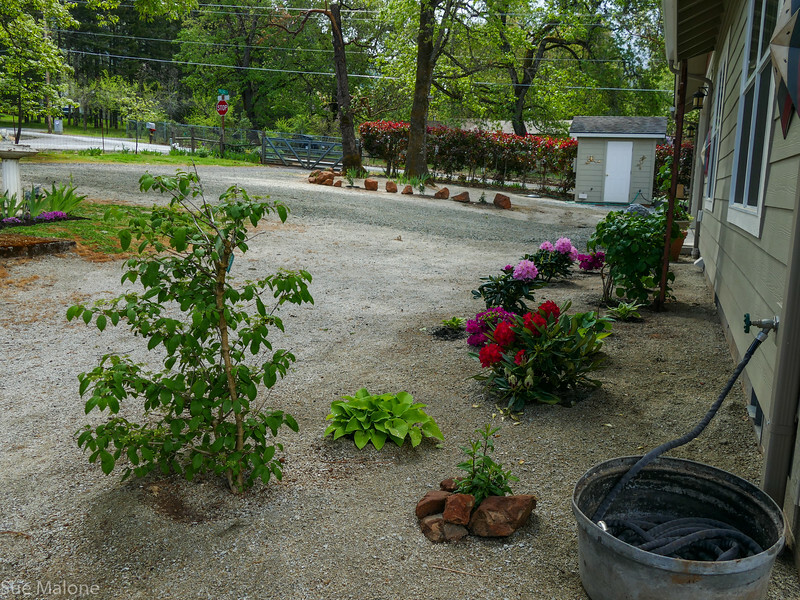 At the moment we are having days in the low 80’s followed by days that never manage to get to 60 degrees F. Nights are cool, but no longer frosty, and the flowers here at Sunset House are thriving. I am watching the weather today, because we are planning some outdoor activities with famous fabulous guests in town, and the skies go from blue to gray and back to blue in a matter of moments. Crater Lake awaits. Today we will do the classic round trip tour over the mountains hoping for sunlight to highlight that fabulous blue. 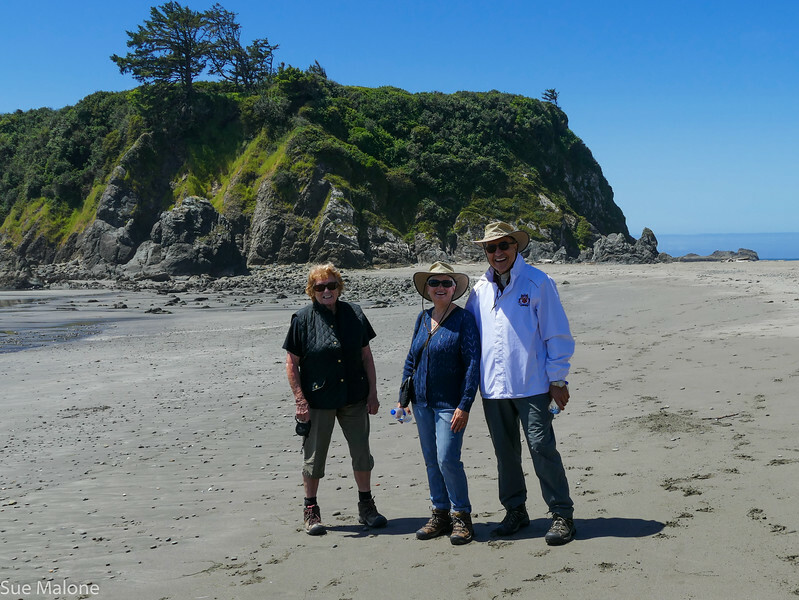 That is another story, one that will evolve over the next week that we get to share with long time friends, Erin and Mui, from Two to Travel, who are on the road in the west for the first time in a long time. 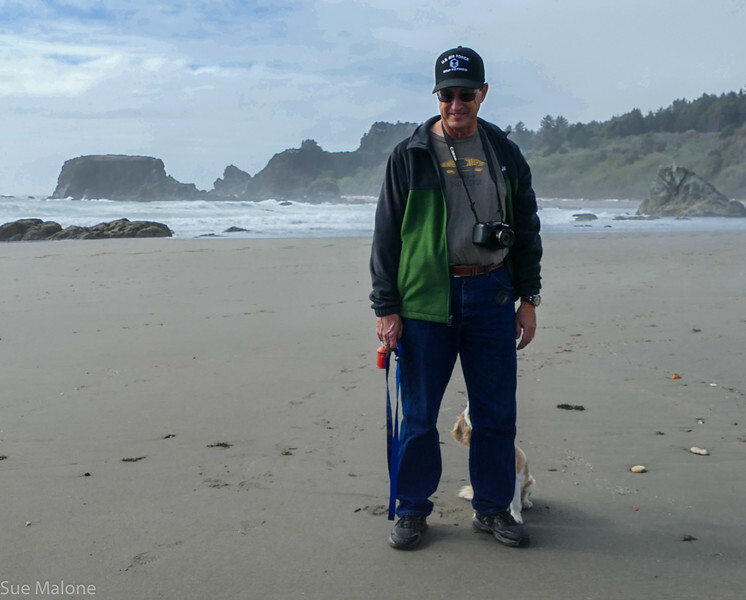 We had time for a bit of travel ourselves this month, with a quick trip to the Oregon Coast to share a couple of days with other blogging friends, John and Carol, from Our Trip Around the Sun. They are on their way north to Alaska, and passed so close to our home that we couldn’t miss the opportunity to spend some time with them. 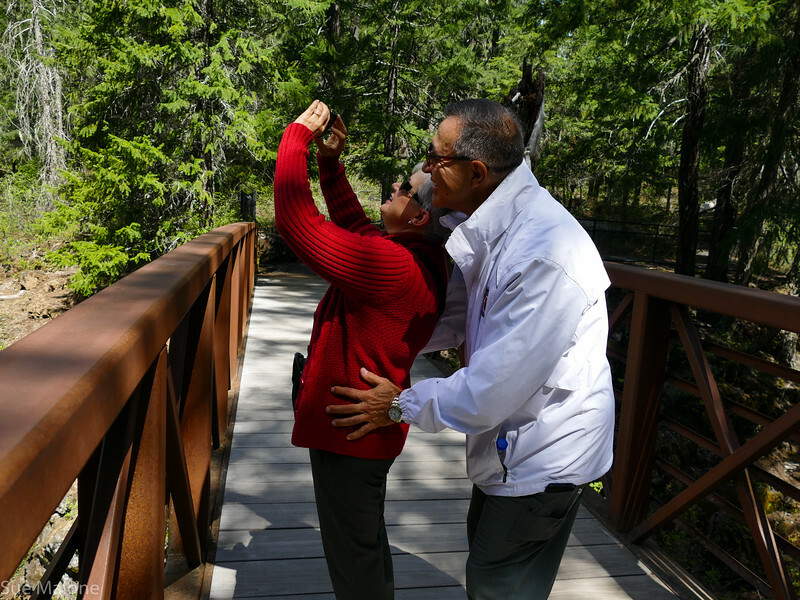 The last time we visited, Carol and John were volunteering at Ding Darling NWR in Florida. 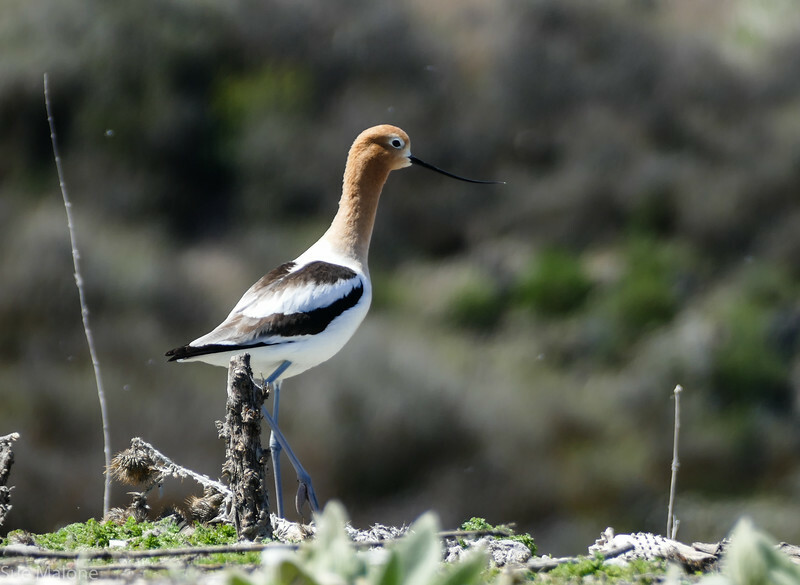 They showed us a fabulous time with tours of the refuge, time at the beach together, and a truly fabulous dinner that lasted well into the night. Some people are just right, and laughter is often the key. We shared a lot of laughter with them. Their love of Jimmy Buffett, good margueritas, and a joyous approach to life is contagious. 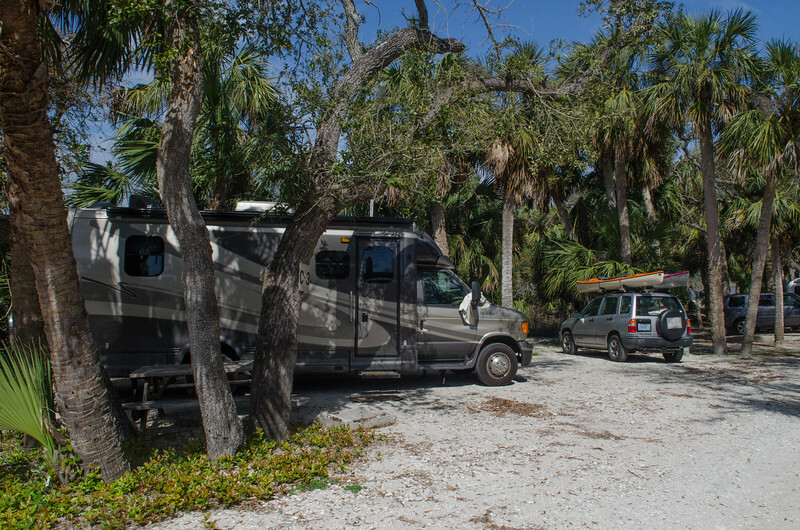 We met at Harris Beach State Park, where they found a site big enough for their rig along the back row in the trees. Harris Beach is in the process of some renovations, so we weren’t able to snag a spot there, and instead Mo and I camped down on the waterfront at a private campground. 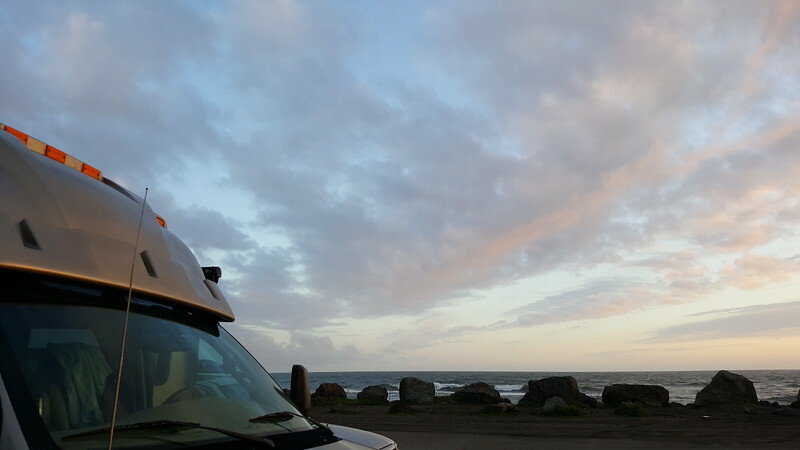 I loved listening to the sound of the surf all night long, and the wind and rain on the roof lulled me to sleep. The sun came out for our beach walk with the dogs, a rather funny time for Mattie and Jimmy who are not exactly similar in style. 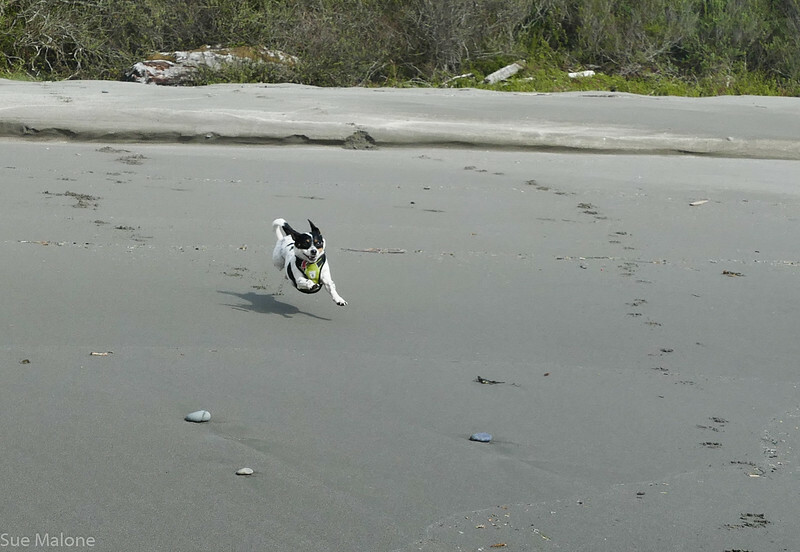 Mattie is crazy about the beach, runs like a wild thing in the sand, and gets very excited. Jimmy, a precious and very sweet dog, didn’t think much of Mattie’s exuberance, and learned to hide behind John’s leg when Mattie came tearing at him, trying to get him to play. I was a bit embarrassed, because there is just no stopping Mattie when she gets like that. Play with me, NOW! I think Mo and I made a big mistake when we let her play with the huge bloodhound that used to wander over to our house for doggie visits. Mattie learned to play rough to keep up with him, and he loved it. Jimmy, not so much. In fairness, Mattie does great at the dog park, and at doggie day care she was a hit, so she isn’t mean, just very high energy. We had dinner at the Sporthaven Grill, on the patio in the threatening rain, where the waitstaff brought us warming blankets and turned on the big propane heater. It was quite delightful. We also spent most of a rainy day in their home, with snacks and drinks and a new game called Skip-Bo. I guess it isn’t a new game, but it was new to us and created more opportunities for lots of laughter. 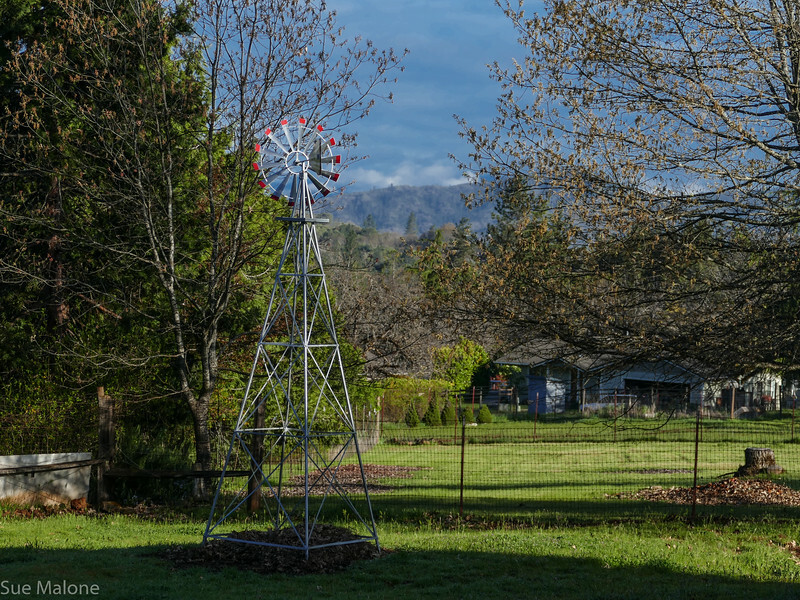 We came back home to spend more time fiddling around on the property here at Sunset House. 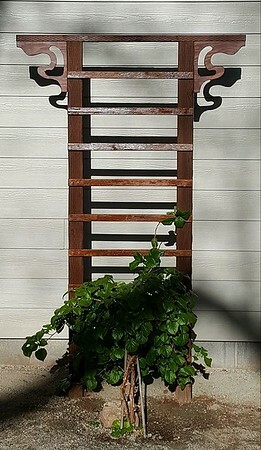 Mo built a beautiful arbor for a treasured vine that I have babied and coddled along since I first bought it in 2002. She is finally happy here in the wonderful Grants Pass climate, protected from the sun and the heat on the east side of the house where she now lives with our new rhododendrons. 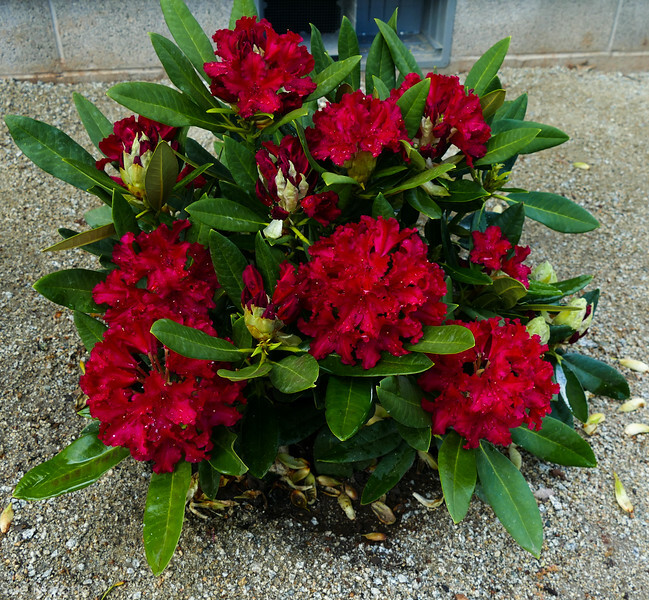 I have loved rhodies ever since I saw my first huge bloom at a nursery in Southern California. 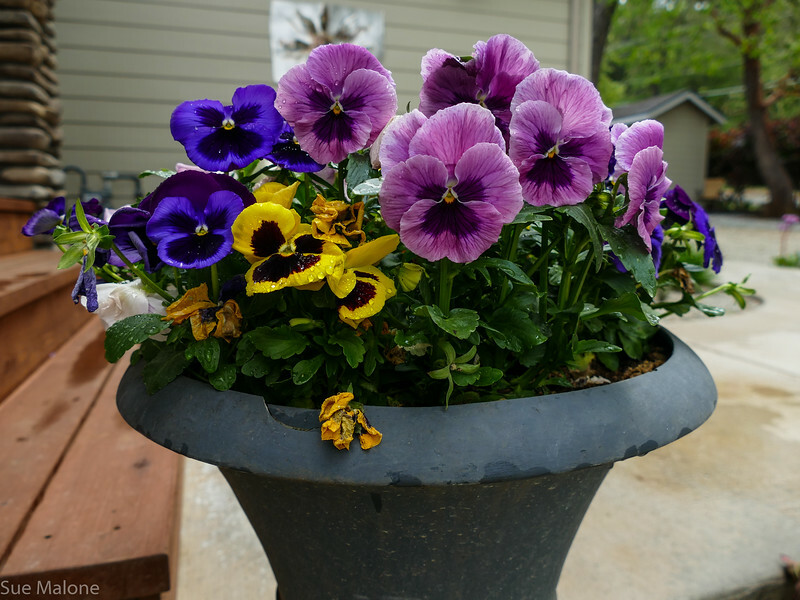 Yes, I even remember the moment, 1963, when my eldest was an infant and my husband and I were daydreaming about someday having a place to plant flowers. It was exciting to find the colors we wanted and to dig the holes nice and big, mulch them deeply and give them the perfect site. 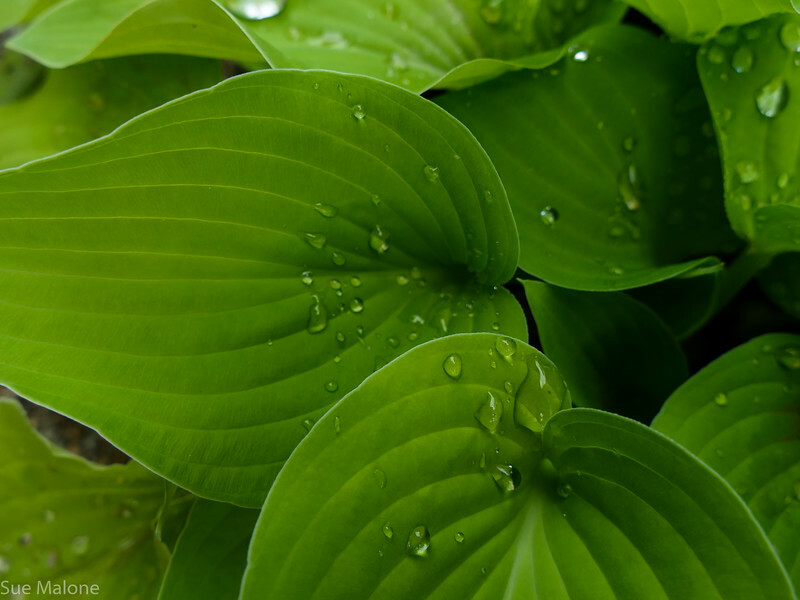 I finally transplanted all the hostas, some plants that I brought from my home at Hauser Lake in Idaho back in 2002 when I moved to Klamath Falls. Others were brought over from Mo’s house in Rocky Point. We babied them through the incredibly hot summer last year and I know they are also very happy to be on the shaded east side of the house at last. Rhodies and hostas, another favorite thing of mine. We started going through the RV shed, purging unneeded “stuff” with the help of the Facebook Marketplace. That app works great, much better than the local Craiglist. With facebook I can view the profile of anyone requesting to see our stuff and it is bit easier to be selective about giving out an address or phone number. With Craiglist, I was immediately bombarded with several fake purchasers offering to send me a check and have it clear before their “shipper” would pick up the item. A huge scam!! So glad I didn’t fall for that one. One of my most favorite things about Sunset House is the light. 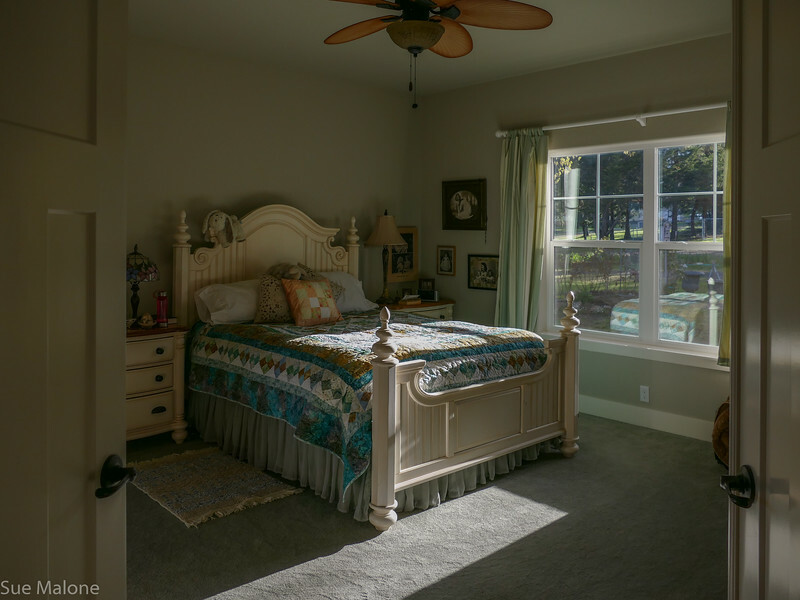 Morning sunshine streaming into the bedroom is the best part of an east facing bedroom window. 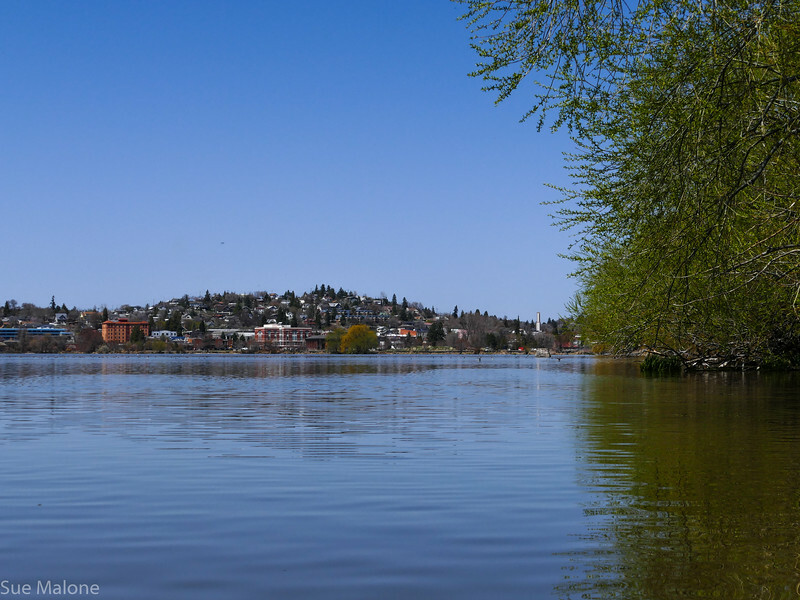 Mid month we took a few days of mini vacation time for a few days of kayaking over on the east side of the mountains, where spring is a bit later arriving, but nonetheless, we were blessed with gorgeous sunny days. 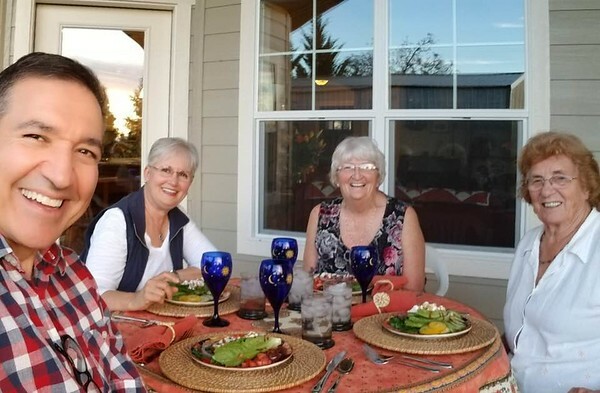 We spent the nights in our little apartment, where we now have renters in all the others except the smallest, Apartment B, where I used to do all my quilting during our transition times living at the Apartments in Klamath Falls. 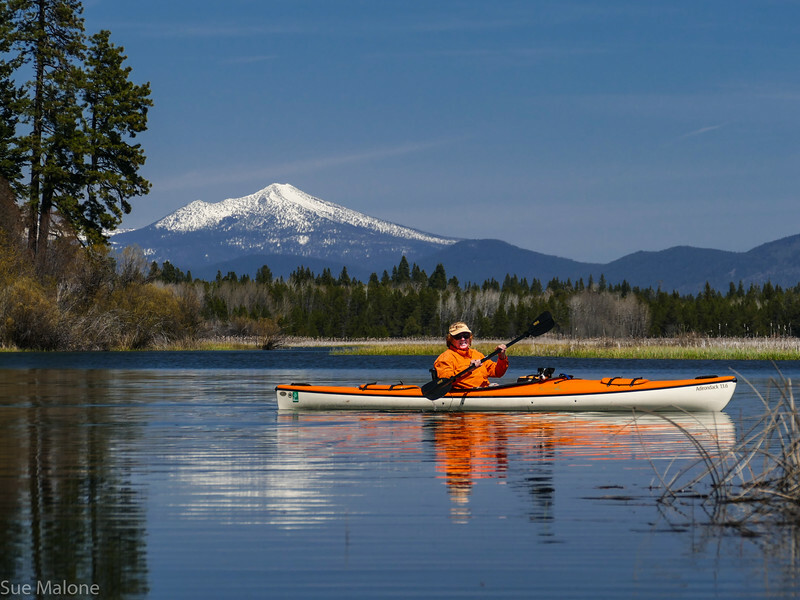 We have yet to find any kayaking that appeals to us here on the west side of the mountains. The Rogue River is a bit big and rowdy for us, and the few lakes are actually reservoirs with barren shorelines. Not our style. 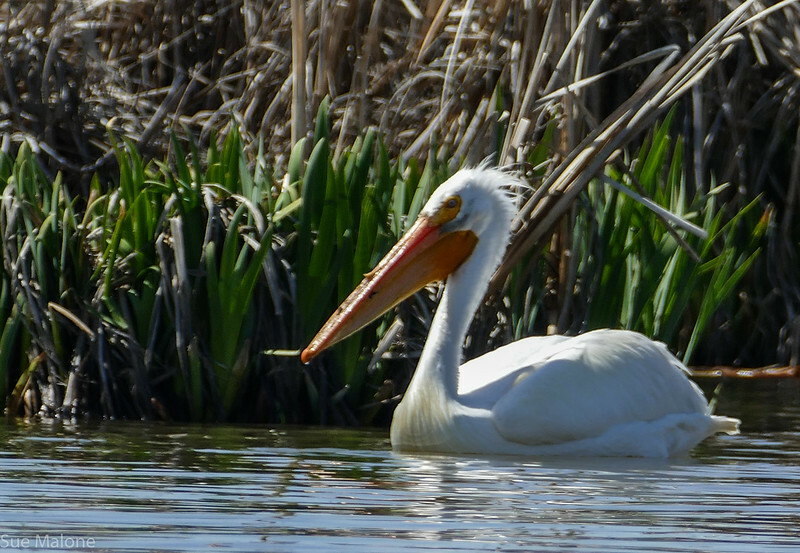 We love the refuges and birds that we find when kayaking in the Klamath Basin. 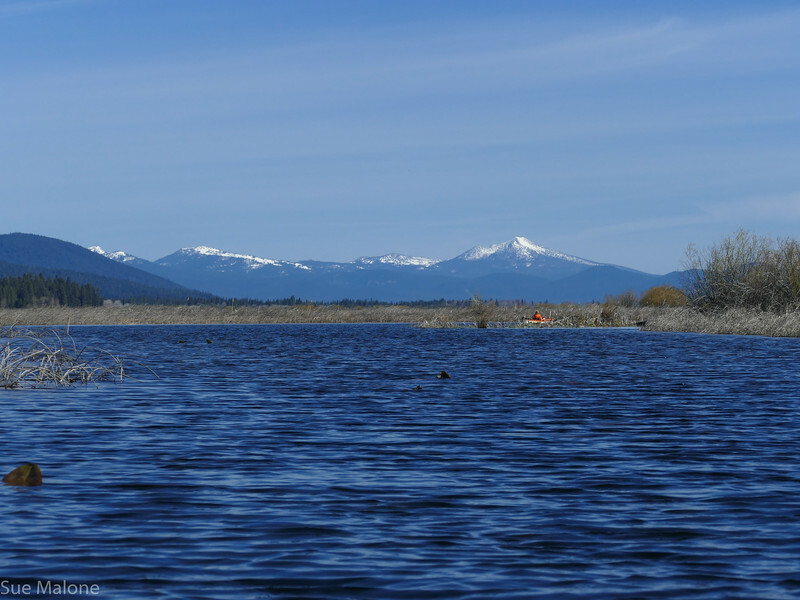 We launched our kayaks for the first time in all the years we lived in Klamath Falls on Lake Ewauna, the body of water between Upper Klamath Lake and the Link River and the Klamath River. 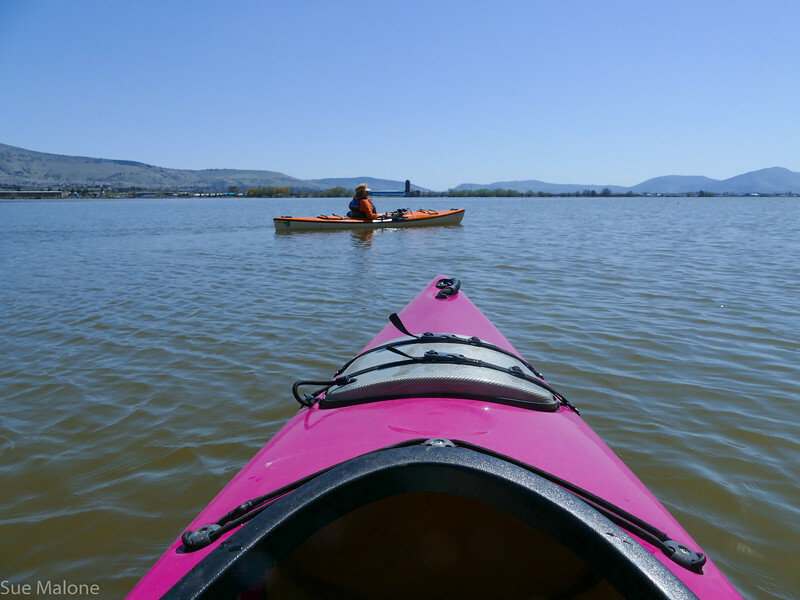 The launch is right in town at Veteran’s Park, and is in a more populated area than we usually kayak, but nevertheless, we were treated to some fabulous birds and great views of Klamath Falls proper from a completely different perspective. The next day we returned to our favorite kayaking spot of all time, our very own Recreation Creek. The mountains in the distance are the ones around the rim caldera of Crater Lake, with Mt Scott on the right. 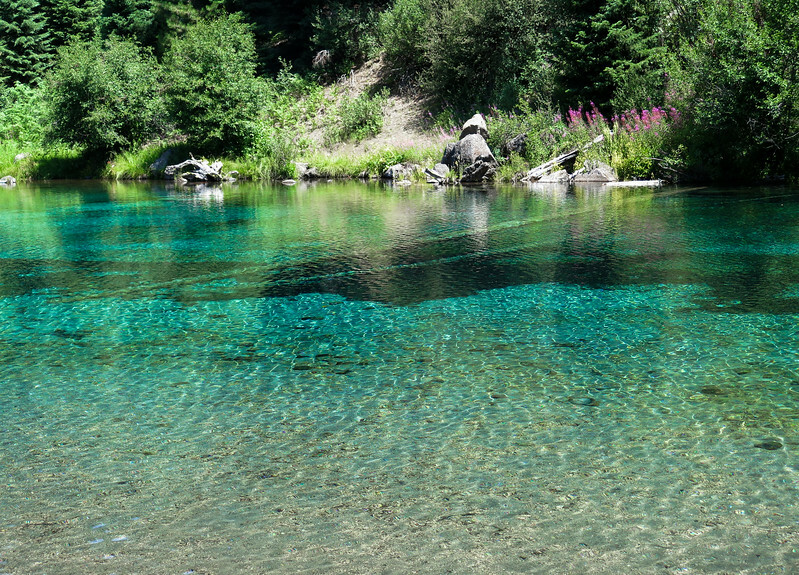 We launched at Malone Spring and traveled north to Crystal Spring, truly one of the most amazing places to enjoy in the entire Klamath Basin. 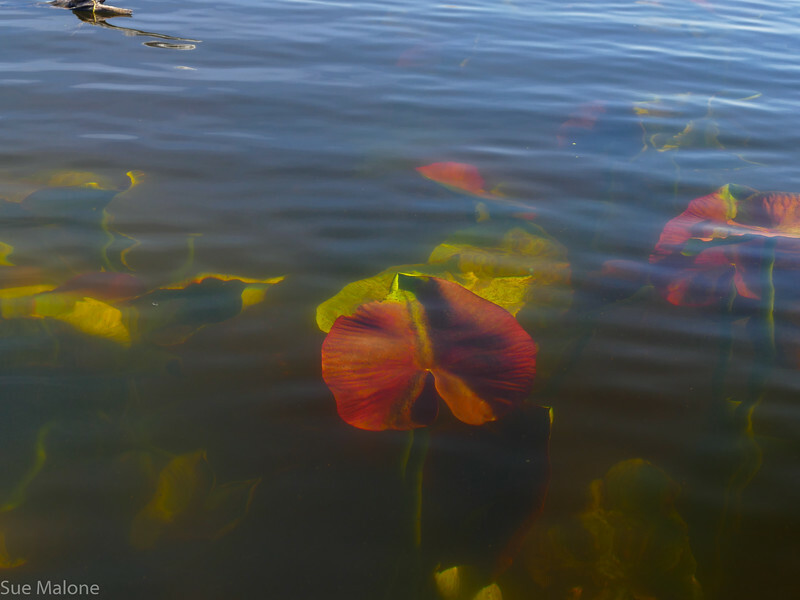 It was still early in the season for the east side, and the wocus lilies were still underwater. I have taken so many photos of blooming wocus, but this time it was completely different to see the gorgeous colors underwater. And thank you, daughter Deanna, for the polarizer lens birthday present. Without it these wonderful colors are just shadows below the water reflections. Another beautiful view of Mt Scott where my family hiked to the top with me on one of my most memorable birthdays ever. 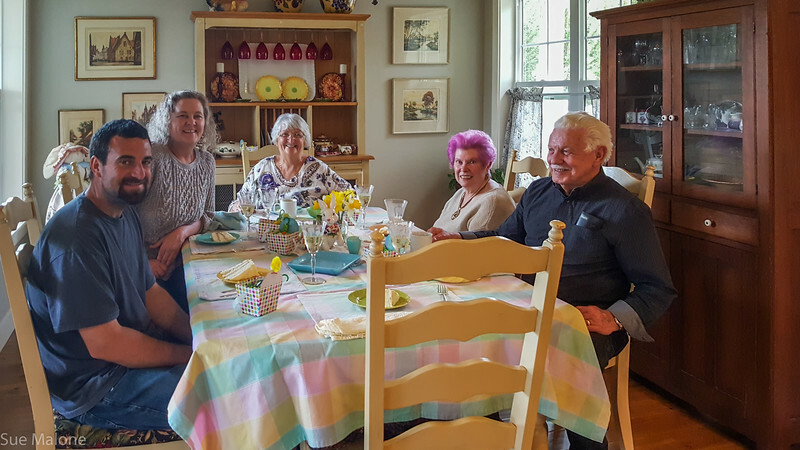 We began our month of course on April Fools Easter, with Daughter Deborah and Grandson Matthew joining us for all the traditional Easter goodies. 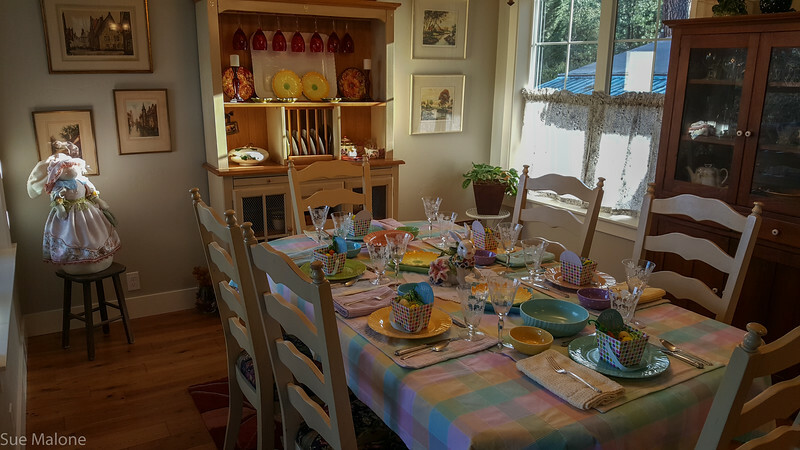 I do love decorating for Easter, with the bunnies and all the energy of emerging springtime. 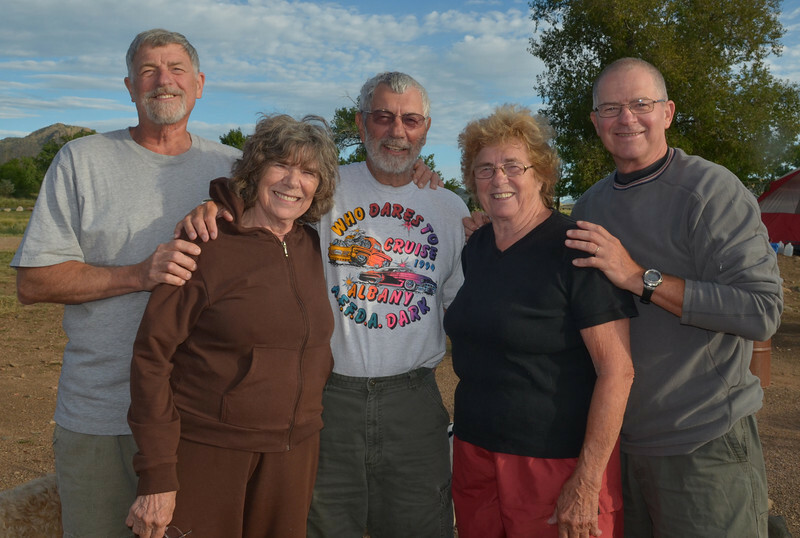 We invited the neighbors as well, a couple who have been good friends with Deborah from the time she lived here in the cottage, and who spent a previous Easter with us back in Rocky Point a few years ago. There is that east morning light again! 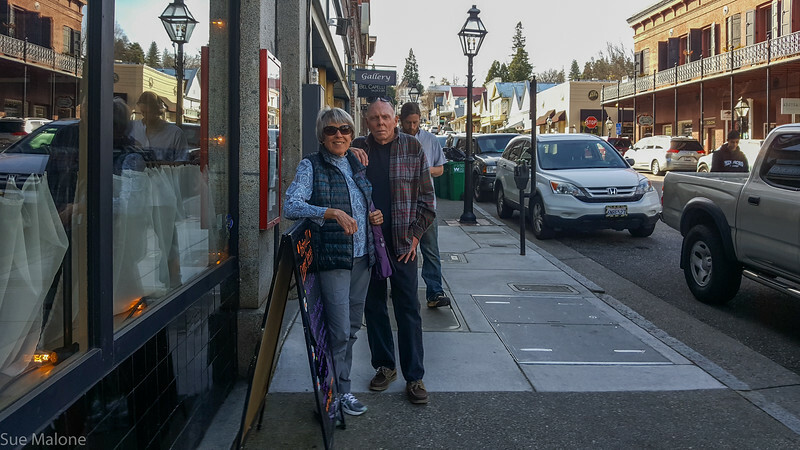 As soon as Easter was over I packed my bags for a quick solo trip to Nevada City, California where I spent a lovely afternoon and evening with Jimmy and Nickie, from the Intrepid Decrepit Traveler. 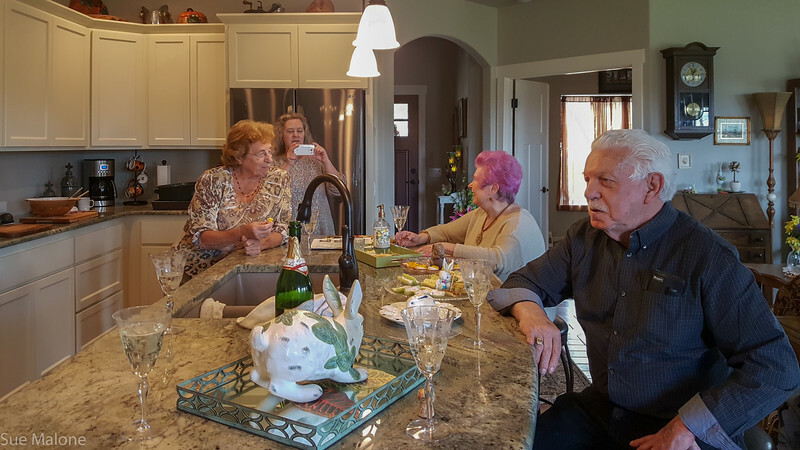 They opened their home and guest room to me, took me to dinner in their charming town, and regaled me with stories of their past travels and their excitement about their upcoming trip to Peru, Machu Picchu, and the Amazon. Such excitement! 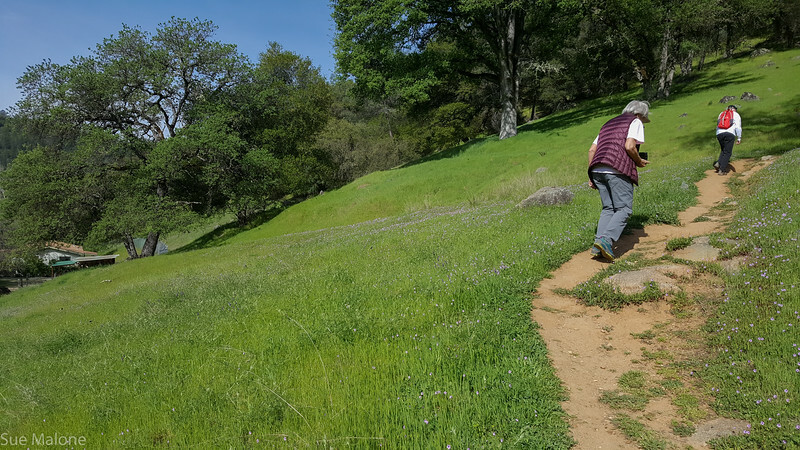 The next morning we hiked a gorgeous springtime trail along the South Yuba River where the warming sunshine had us rolling up our sleeves and pant legs. California is magnificent clothed in that flourescent springtime green, and I loved being there. I then traveled back to Oroville for my annual girl-time visit with lifetime best friend, Maryruth. We are going on 55 years of friendship now and it is something I treasure. Maryruth loves to cook and she spent several days cooking up tons of goodies so we wouldn’t have to cook much during my visit. What a treat! 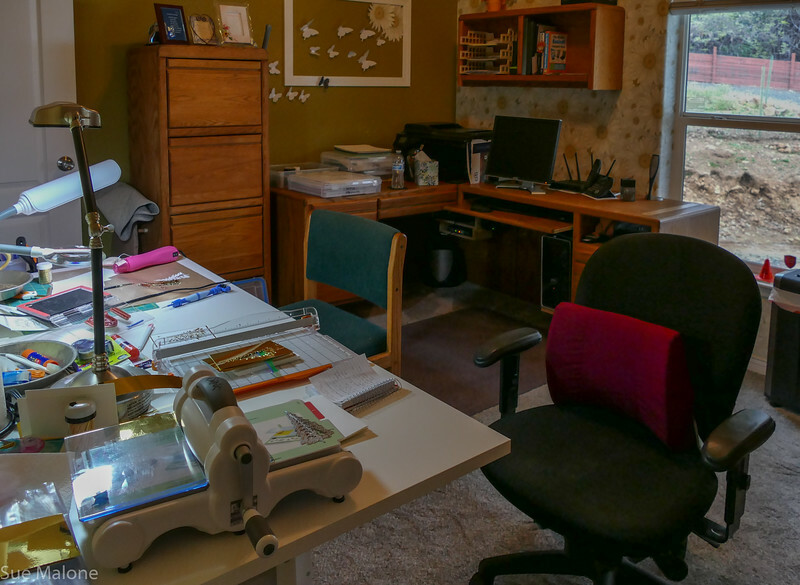 We spent most of the time holed up in her craft room office making cards, a hobby we both have come to love. We spent a long time anticipating this card making retreat, and actually didn’t leave that room very much during the 3 days I was there. SO much fun. 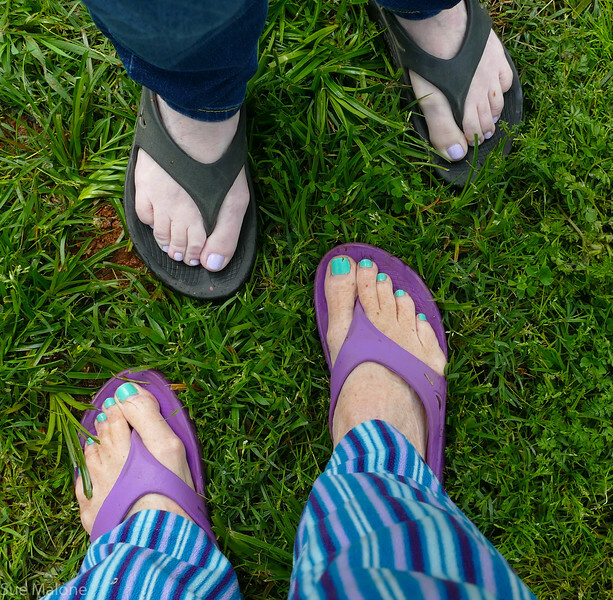 Of course I don’t have a lot of photos of this time because I was quite busy, and every time I bring out the camera, Maryruth has a fit, but we did at least manage to get our traditional toe photo. We have done these photos for a few decades, to prove we were together, back in the days when selfies and tripods weren’t the norm and we couldn’t ever get a photo of the two of us at the same time. Other days of the month have been filled with making a slide show for Mo’s brother Roger’s Memorial happening in late June. It was a new thing for me, and of course I had to call on my trusty friend Erin once again. If you want to get lost in some of the most amazing wildlife and travel photography ever, click on that link. Erin is always so amazing in her willingness to share and help me when I need to understand anything relating to photography and especially Lightroom. Her expertise has been invaluable to me over and over again. I managed to get the slideshow finished, and ready for the family’s review. A big job, but also a fun one because reviewing and editing 437 pictures of Mo’s brother Roger gave me a chance to know him in ways I never did in the 15 years or so I actually knew him in real time.